Physiologe (1787-1869). Document signed. Prag. 1 S. auf Doppelblatt. Gr.-folio. Gefaltet; verso angestaubt. “[…] Receipt for one large microscope no. 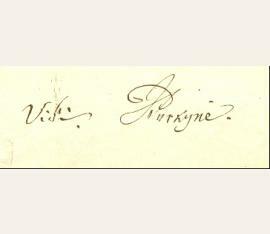 II, lent to Prof. Dr. Hamerník, consisting of the following parts: [here follows a 15-line list of separate parts]. The microscope with its parts is stored in a mahogany box with a lock […]”. – The invoice, made out by the archive of the physiological institute, is signed by Purkinje and H. Wallmann as well as by the physician and statesman Joseph Hamerník (1810–1887). Autographs by Purkinje are rare.